ON DECK MASTER STATEROOM: Forward. 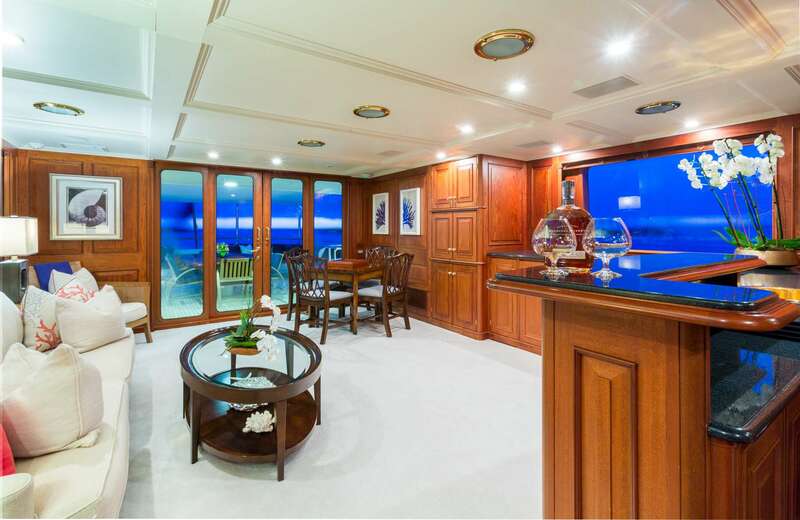 Upon entering, there is an office to starboard and a small drinks refrigerator. 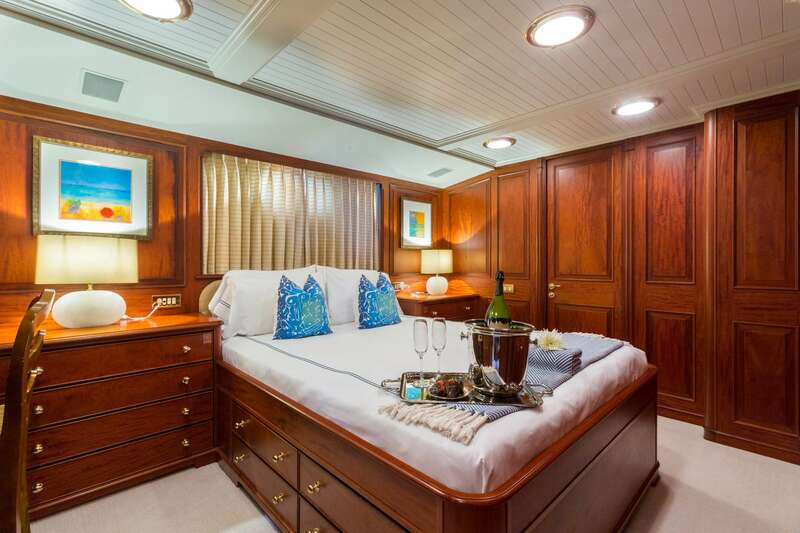 The master stateroom is full beam with walk-around king size bed, sofa, and vanity. 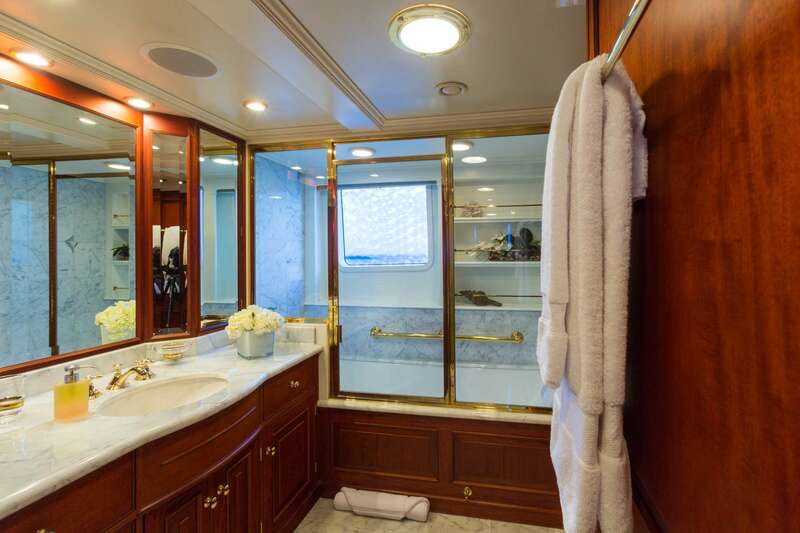 There are two separate entrances to the en-suite his-and-hers bathroom with twin sinks. His with stall shower, hers with Jacuzzi tub. Private head. Entertainment system featuring 27� flat screen TV/DVD/CD with individual satellite receiver, and iPod docking station. 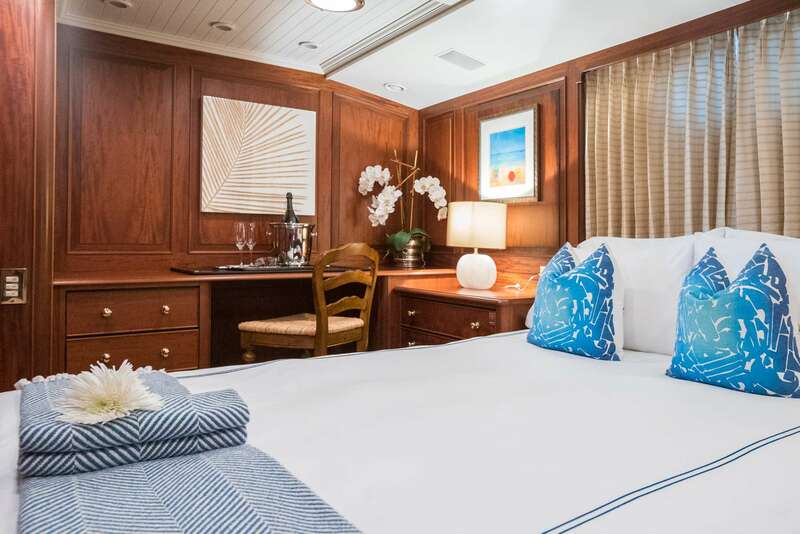 Large windows create abundant natural light in the Master Stateroom if desired. AFT TO PORT: Situated mid-ships. Walk-around queen-sized bed. En-suite features tub with shower overhead, sink, bidet and head. Entertainment system featuring 20� flat screen TV/DVD/CD. 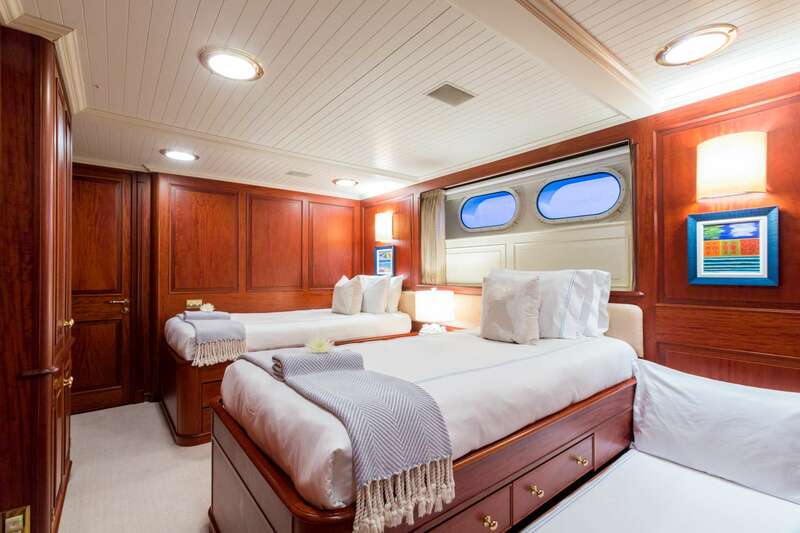 AFT TO STARBOARD: Situated midships: Walk-around queen-size bed. En-suite features tub with shower overhead, sink, bidet and head. Entertainment system featuring 20� flat screen TV/DVD/CD. 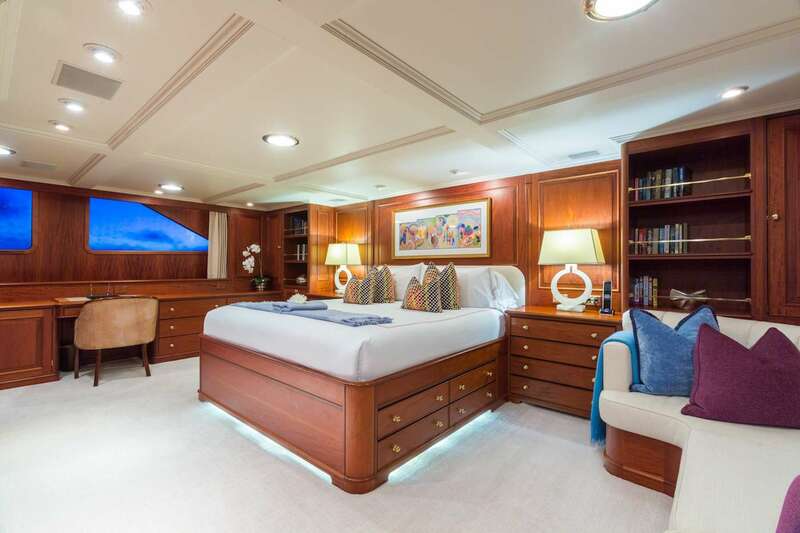 FORWARD TO PORT: Spacious stateroom with twin beds and one trundle, with the option to convert the twins to a walkaround king bed. Entertainment system features 20� flat screen TV/DVD/CD. En-suite features a tub with shower overhead, sink and head. FORWARD TO STARBOARD: Spacious stateroom with twin beds and one trundle, with the option to convert the twins to a walkaround king bed. Entertainment system features 20� flat screen TV/DVD/CD. En-suite features a tub with shower overhead, sink and head. 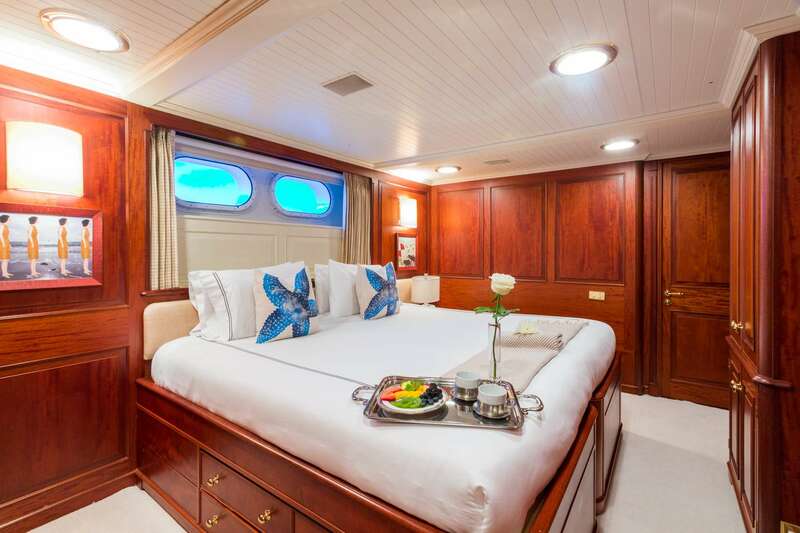 All staterooms include individual satellite receivers, individual climate control, port holes allowing natural light, robes, slippers, hairdryers, reading lights, night lights, iPod docking stations, and luxurious bath products. 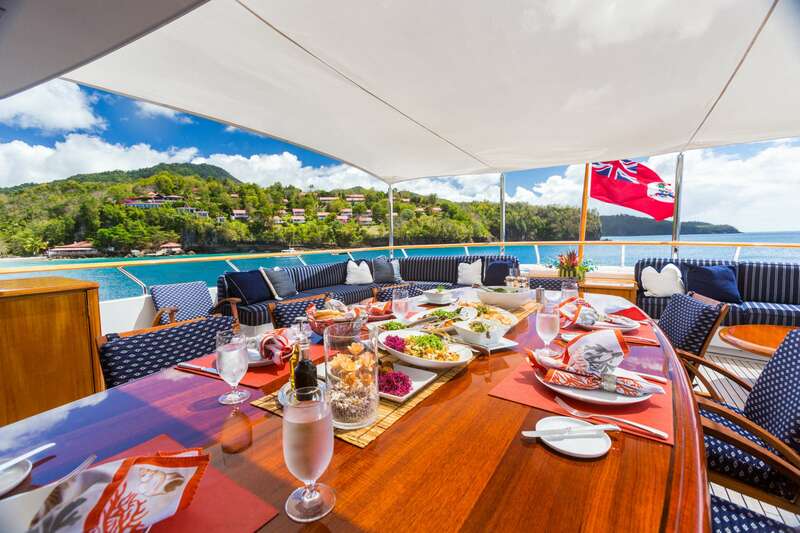 AFT DECK: Covered al fresco dining area for 6-10 guests utilizing the expandable aft deck dining table. 4 chaise lounges with cocktail tables aft. Centerline stairwell to the swim platform. MAIN SALON: L-shaped sofa with coffee table and 2 club chairs. Entertainment center with 50� retractable plasma TV/DVD/CD with individual satellite receiver, surround sound, and iPod docking station. 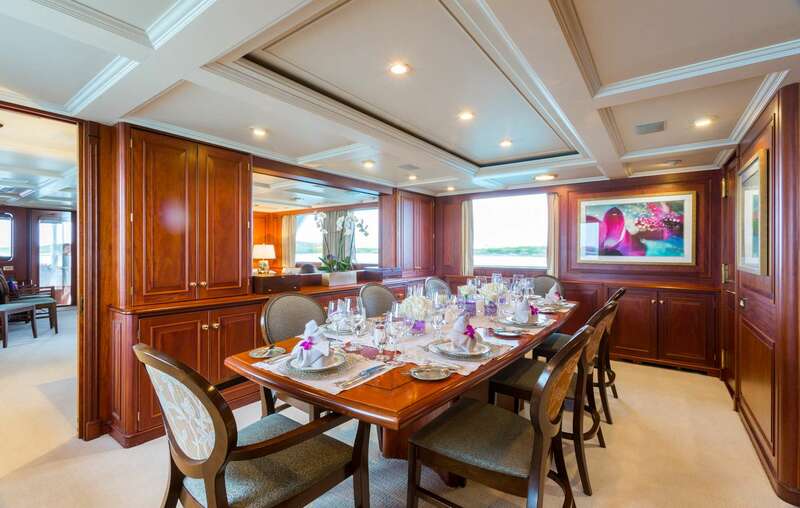 FORMAL DINING for 10 guests in comfort. SKYLOUNGE on BRIDGE DECK: Sofa with coffee table, plus a game table. Bar area. Entertainment center with 50� retractable plasma TV/DVD/CD with individual satellite receiver, surround sound, and iPod docking station. 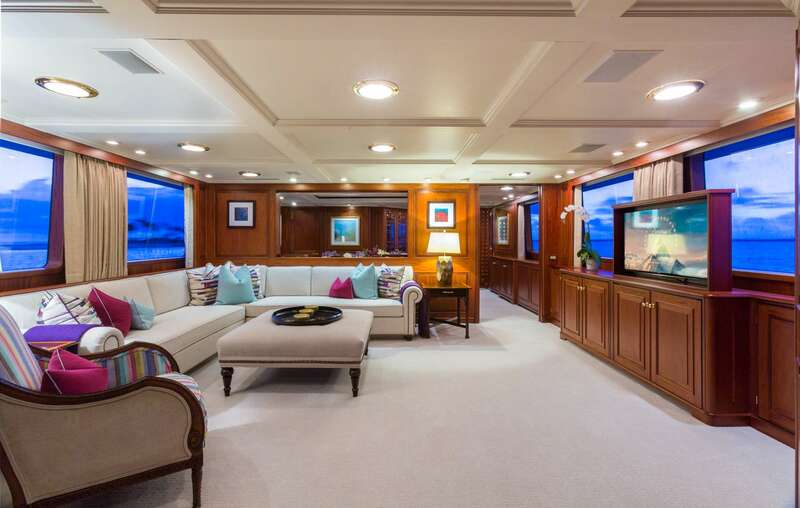 BRIDGE DECK AFT: Magnificent oversized deck with generous seating for al fresco dining. Optional umbrellas provide ample shade. 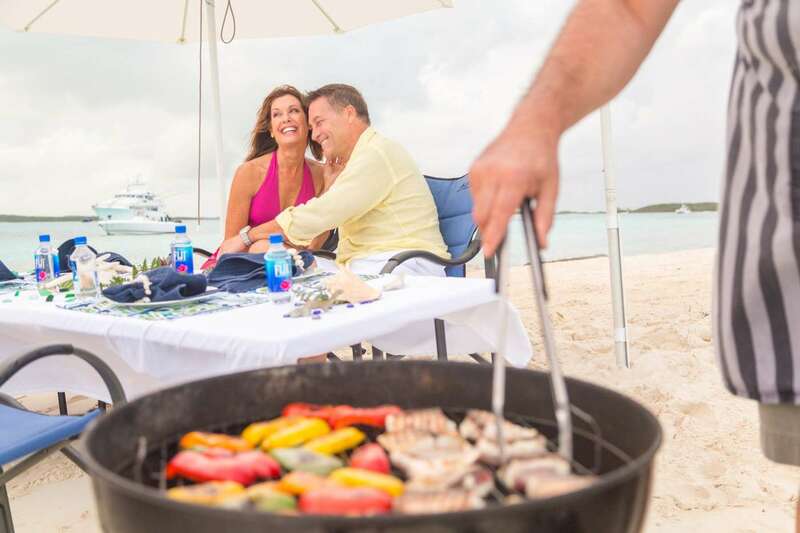 SUN DECK: Oversized sun pads, full wet bar, Jacuzzi, and two chaise lounges. Exercise Equipment: Free weights, yoga mats and instruction DVD�s, resistance bands, pull-up bar. 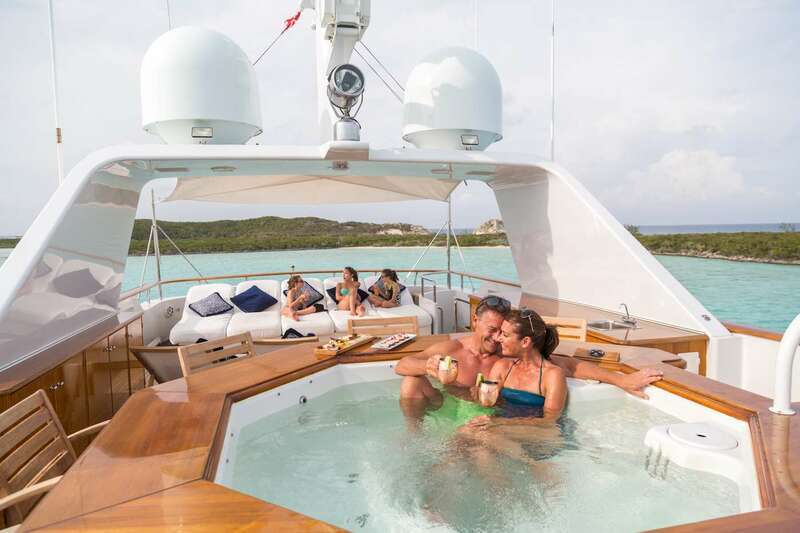 SCUBA � the yacht is equipped with 6 full dive sets and commercial grade dive compressor for certified divers only. Captain John developed his love for boating from the shores of Lake Erie in Sandusky, Ohio. He began sailing competitively and fishing from his earliest years. The passion followed him to Connecticut along with a love of all competitive sports. Two weeks after finishing at The University of Connecticut his professional Yachting career began! Captain John started as an engineer in the industry, ultimately supervising the construction of three vessels as an owner's representative. 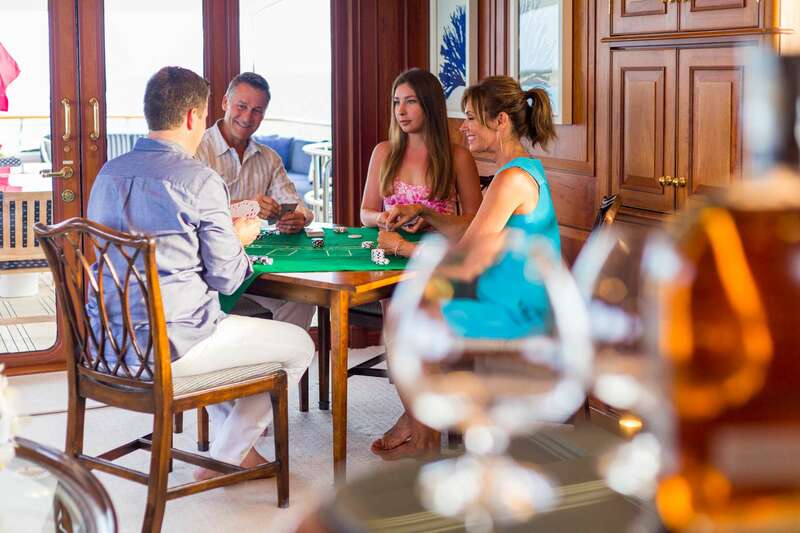 John has spent thirty years now as a professional yacht crewmember. 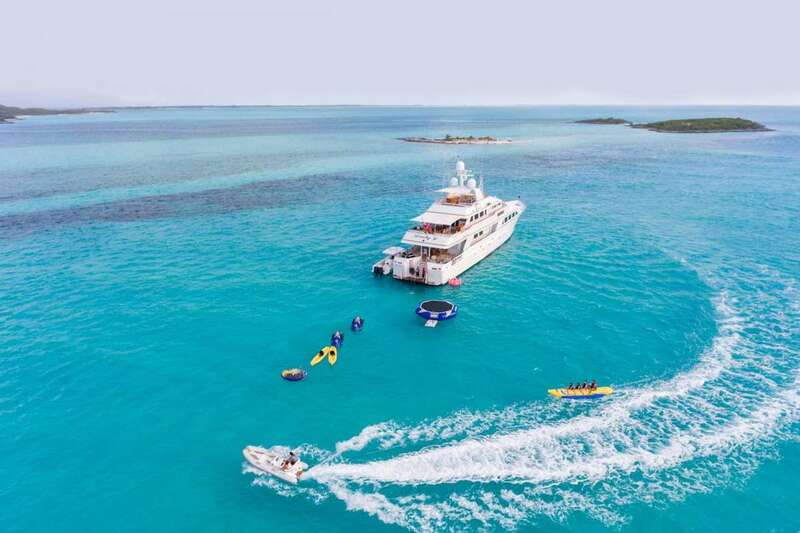 He has cruised extensively in the Atlantic, Pacific and Caribbean oceans, making friends with locals and guests all along the way. 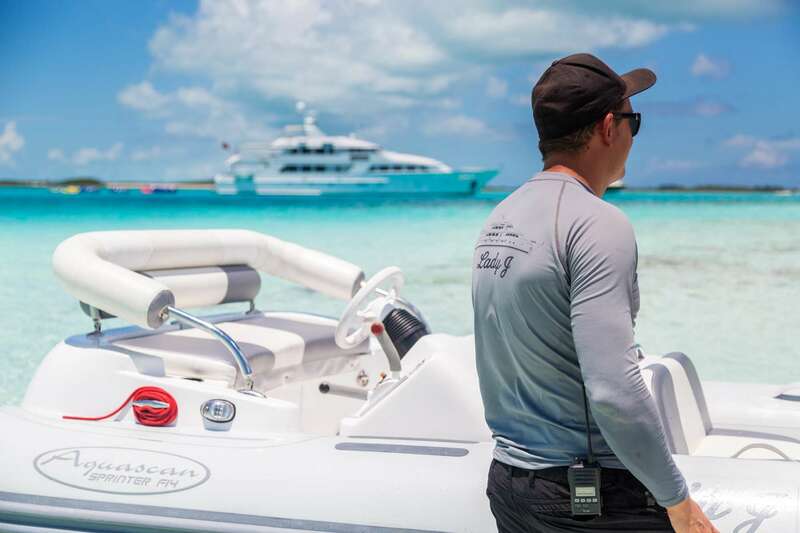 Captain John holds many certifications to make your charter fun and safe. He has a 1600/3000 Ton Master of Oceans License. Celestial navigation, medical training, firefighting and ship's security are a few other pertinent qualifications. Jarryd grew up on Durban Beach in South Africa. He spent 6 years in hospitality where he played an intricate role in the progression of taking a Cocktail Bar to a successful franchise, ultimately opening several stores across South Africa. During this time he competed in flaring competitions (think Tom Cruise in Cocktail) and studied a Masters in Bartending. He also has a degree in Marketing and a Diploma in Advertising/Brand Management. 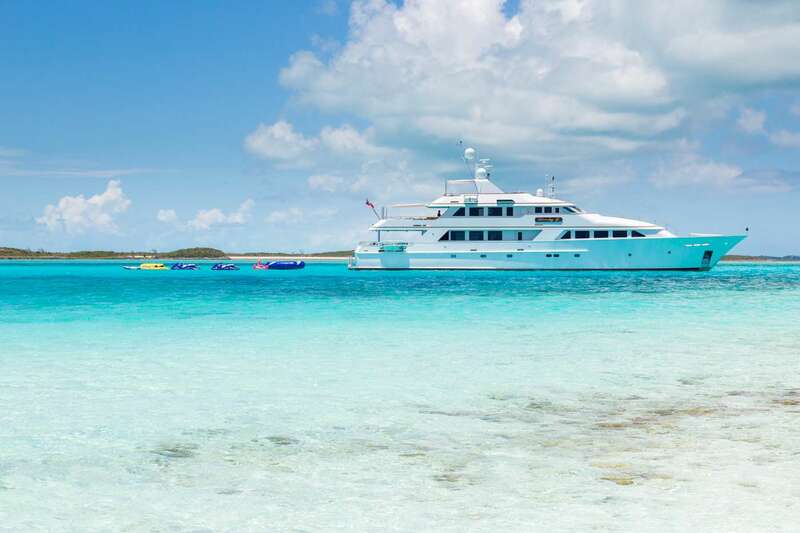 Jarryd started yachting in 2009 and since then he has completed five Atlantic crossings and sailed around the Caribbean, Bahamas, U.S.A, Mediterranean, and the Gulf of Mexico totaling around 60,000+nm. Jarryd currently holds the chief mate and is working towards his Master license. He enjoys exploring the outdoors, traveling, adventures, diving, surfing and long boarding. Carlos Manriquez, aka “The Sorcerer of Sauces”, is one of the most inventive and spontaneous chefs today. Renowned for his culinary skills and his ability to establish critically acclaimed restaurants and catering companies, coupled with his global adventures in extreme cuisines, and his passion for the next dish, is what keeps the crowd’s attention! Born in Tijuana, Mexico into a family of dairy farmers, Carlos began his culinary career at a very young age. He always loved helping his mother in the kitchen, which was not very common in traditional Mexican culture. Carlos attended private boarding school in North Dakota where his culinary journey began upon taking a job in the kitchen as preparation cook. Working alongside international students fueled his interest in travel, which resulted in a global journey spanning over 53 countries, where he began researching unique food preparation techniques and extraordinary world spices. Carlos obtained a technical degree in Dairy Science from the California Polytechnic State University. He worked for several restaurants, which cultivated into a broad scope of culinary growth. From his apprenticeship with Wolf Gang Puck in San Diego, Carlos decided that the art of creating food was his true passion and he went back to school to obtain a culinary degree from the Le Cordon Bleu. He was born and raised in Point Pleasant, NJ. Brian’s life on the water began at the age of 5 and has not stopped since. After high school he went to college for Criminal Justice and soon realized it wasn’t for him. 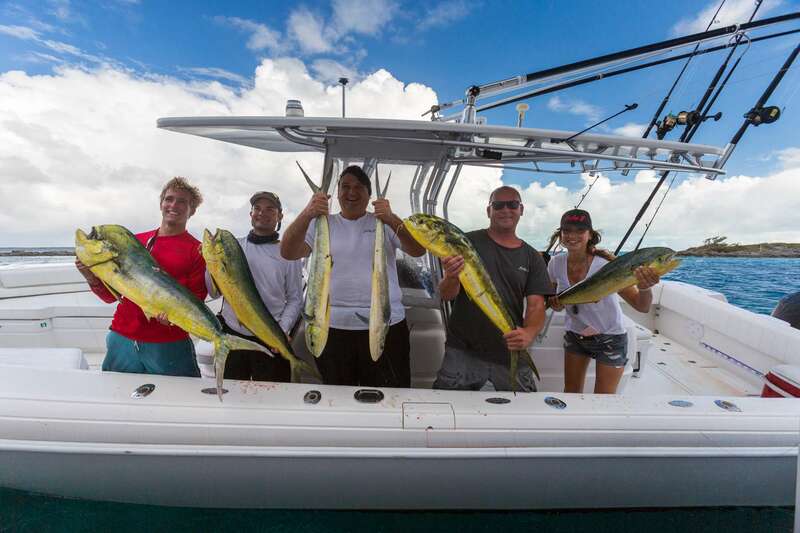 He started his yachting career in 2011 but took a break in 2015 and sailed his own sailboat through the Caribbean and Panama where he had his fishing business and became a dive master. Brian’s new adventure brought him on Lady J and he is exited to improve or share his knowledge and show our guests the time of their life. Sam grew up in the desert of Southern Arizona, but he has always been drawn to the water, both as a competitive swimmer and on holiday in Mexico. It was only a matter of time before he followed his dreams and started a career in the maritime industry. For the last year he was working in Boston Harbor as a Deckhand onboard fuel barges. It didn’t take long time for him however to seek out sunshine and move down to Florida for his new chapter. Cristina was born on the coast of Black Sea in Romania and she moved to Sicily at the age of 18 where she fell in love with the Italian culture, language and food. She has 13 years of hospitality and she even owned her own restaurant in Catania, Sicily. She traveled the world learning about different countries and habits from China to India, from Thailand to Dubai, from Africa to Europe. 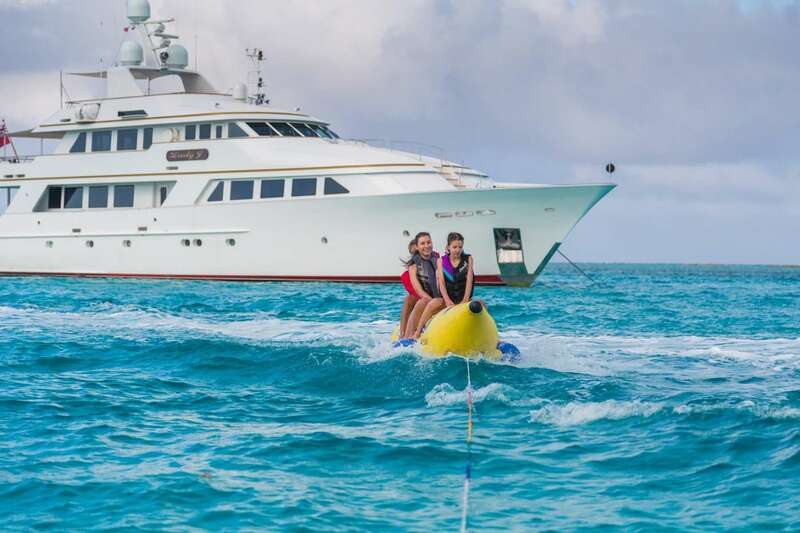 Cristina realized that yachting would be the right combination to have an amazing life doing what she loves and what she knows best. While in London Cristina completed an Event Management diploma and Swedish massage Diploma. In time she discovered that she likes to write books for kids and paint abstracts in oil. Cristina has a 14-year-old brother that he means the world to her and she gets to be silly playing games or teasing him any time she gets the chance. She is always happy to please and will do everything to make sure you are enjoying your time with us. Karla is originally from Monterrey, Mexico her family moved to Texas when she was still very young. Her passion for traveling came from her family who would always vacation somewhere new once a year. She decided that she need a carrier that would allow her to explorer the world. After high school she worked for several staffing agencies as an account manager and started working part time at a restaurant. She then realized that she enjoyed the hospitality industry and decided to do that full time. Eight years later, she had done it all from serving to bartending to even becoming a front of house manager at her favorite wine bar. 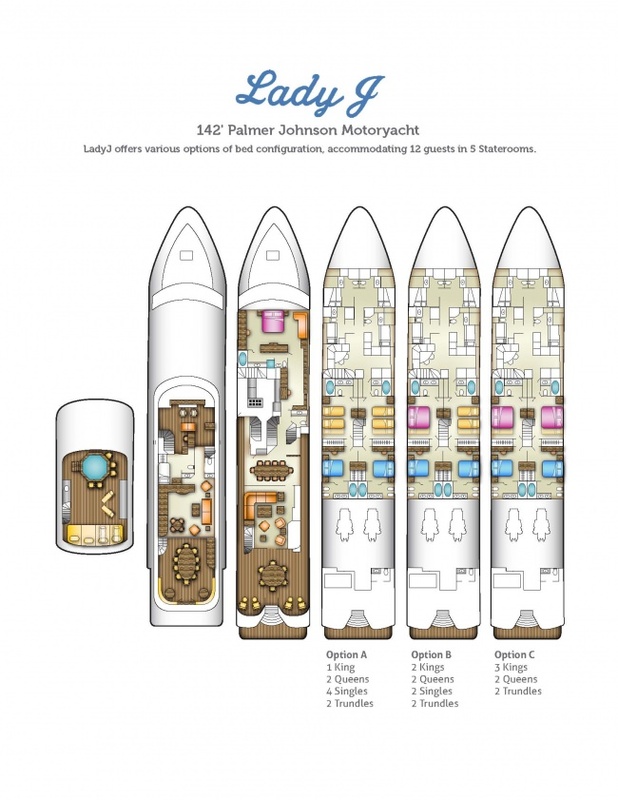 She then decided to combine both her passions and she moved to Florida to become a yacht stewardess. She hopes to one day be able to move to Washington State and be able to help rescue animals from her own backyard. Sam was born in New Orleans, Louisiana and grew up bouncing around between New Orleans, New Jersey, El Salvador and California. She graduated with a degree in Finance and Graphic Design from the University of San Francisco and after working in the hospitality industry all through college; she began her career as an investment banker. Deciding to switch gears 4 years later, she went back to school to become an early childhood educator and dedicated the next 5 years of her life to a beloved well-known private preschool in the bay. Her passion for education and giving back to society led her to her next move of giving up her comfortable life in San Francisco and volunteering for 2 years in the islands of Bocas del Toro, Panama. 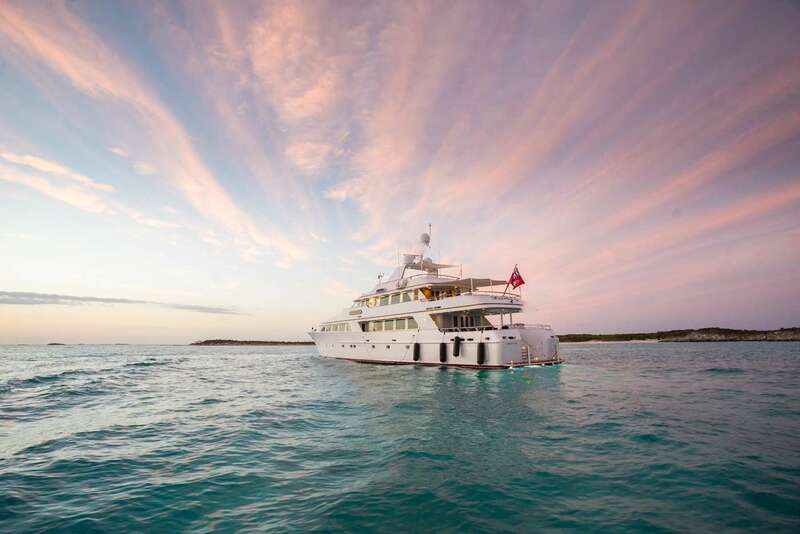 It is there where Sam re-affirmed her love of the ocean and became interested in the yachting world. Sam brings a diverse set of skills and she is looking forward to providing quality guest servicing on board. During her spare time, Sam enjoys being out in nature, drawing, writing, singing, and dancing.